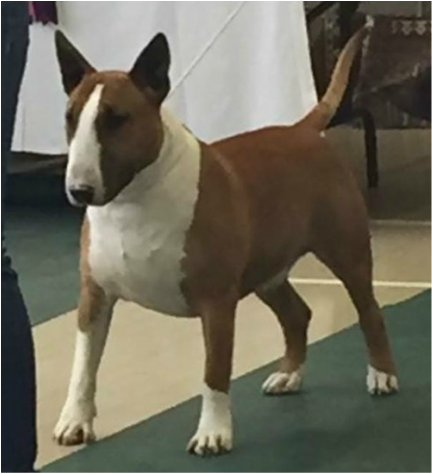 I would like to thank the committee of the Coloured Bull Terrier Club for inviting me to judge their open show, and also to the exhibitors for their entries, I thoroughly enjoyed the day. 7 year old red and white, head has gentle profile and is well filled, correct ear carriage, plenty of bone and substance, good forechest, cat like feet, level topline with well bent stifle, moved with drive. Tall red and white, gentle turn to head with good ear placement, correct mouth, well made, tight feet, moved well in front close behind. Black brindle and white, strong head with plenty of fill, correct ear placement, plenty of bone with good forechest, short back, would like more length of leg, well handled. 8 month old red and white, good head and fill, correct mouth, well placed ears, straight front, good forechest, tight feet a little long in back, carries tail a little high. Red, tall with strong head, well placed ears, correct mouth, good front a little long in back, tight feet, moved well. Showy red and white, good head with correct mouth, keen eye and correct ear placement, well made with good forechest, tight feet, excellent condition, well handled. Red and white, decent head, correct mouth, needs to use his ears, well made with good forechest, straight front, short back and tight feet. Solid red, good head with plenty of fill, would like more length to head, correct ear and eye, straight front, good forechest, level topline, moved well. Red and white, strong head with plenty of fill, keen eye, mouth correct, good ear placement, good forechest, a little upright in shoulder, tight feet, short back, enough bone, and well handled. Solid brindle, terrier type, head has gentle turn and fill, good eye and ear placement, correct mouth, straight front, level topline, tight feet, would like more bone, moved and handled well. Black brindle and white, strong head with plenty of fill, correct eye and ear placement, great bone and forechest, short back, well handled. Small black brindle and white, beautiful head which has gentle turn and fill, correct mouth, enough bone for size, straight front, good forechest, and tight feet, well handled. 12 month old, brindle and white, head has gentle turn and fill, correct mouth and ear placement, good forechest, tight feet, good bend of stifle, moved well. Pretty tricolour which has gentle turn and fill to head, ears bang on top, good bone, tight feet, short back, well handled. Pretty rich brindle and white, head has gentle arc and fill, ears bang on top, good forechest, tight feet, enough bone for size, moved well.